March 15, 2017 by Susan G.
As trainers, we’ve all been there in the decision-making process. And really, those of us who ride are always training (or, sometimes un-training) our horses to do “something.” At a professional standard though, we have many more questions to ask ourselves when trying to provide the best option for our mounts, and our clients. At all levels, it is typically the horse himself who provides us with the most wisdom and profound teaching. 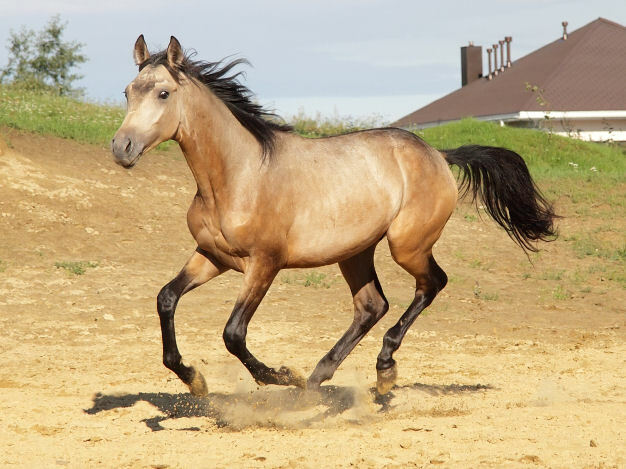 As with any human athlete, an equine in a high-performance discipline such as jumping, dressage, or reining, attains various periods of peaks and lows throughout the development process. On a day that the athlete feels good, all the training elements might come together for a surprisingly optimal effort, transcending even the current level of fitness. Ask any marathon runner how they feel the day of, and then after the big event! Subsequently, the euphoria reached by the athlete, bolstered by accolades—say, for example, lots of pats and a happy rider—can manifest in painful ways the day after. Maybe your horse was enthusiastic about entering the arena yesterday, but today he stops before the gate, even taking a step backwards. We ignore the whisper of the horse’s body language, and urge him forward. Perhaps he trots over a few small cross-rails with ease, then suddenly spooks at a larger coop he scaled effortlessly the day before. Or was it really effortless? Did his rider forget about the stumble he took upon landing? He feels sound enough…but why the uncharacteristic spook? Dismiss and trot on, or, get off and begin the search for possible “hot spots” on tendons, or testing for trigger points along the spinal column? Do we return to the barn and contact our veterinarian or farrier? Oh yes, it’s very easy to get caught up in our minds and try to “fix” our horse’s problems based on our own understanding of what might be wrong in the moment. What part of ourselves is speaking at this point? We remind ourself…where does compassion begin? The heart. Why do we practice mindfulness? To learn to “see” from the heart, and trust the subtle signals that are trying to override the noise from our head. It is the best chance we can give our horses, and ultimately, the most compassionate choice. Co-blogger Melissa Deal has once again shared a very important aspect of our riding lessons. That is, the one taught to us by our horse. Thank you Melissa and your beautiful, wise, Eclipse! Eclipse takes his readership very seriously and though we both agreed that the following story needed to be shared, he declined in writing it as he’s a bit embarrassed. I assured him that shame has no place in his life, but he insisted on my writing it just the same. I am afraid that I am not nearly as humorous as he but I do hope that you will enjoy this excerpt from his adventures. Yesterday, I rode Eclipse, a sensitive and affectionate horse that I am training. It was likely the best ride of this horse’s career! Eclipse was attentive, responsive, giving and accurate. He practically floated through the warm up and performed the more difficult movements with alot more ease than expected. He and I seemed connected at the deepest level. My wish was his instant act, as if he could read my mind. What more could a rider ask? My satisfaction with the second level performance offered by this first level horse was a true gift. My heart swelled with our success. Today, a lovely day, promised an azure sky and warm sunny rays that were perfect for riding. Eclipse’s coat reflected the sunlight like a polished penny. I got on completely without expectation and no plan. I knew better than to try to repeat yesterday’s performance. It’s akin to trying to re-achieve nirvana. Here’s the story of our ride. I can only hope that relaying it will imprint the life/riding lesson in my mind and give you some forage for thought as well. The horse seemed even more relaxed than normal in grooming and tacking today. The mounting block was relocated this morning for the first time since we moved to this farm. No problem. Eclipse walked to the block when called, positioned himself neatly and was ready to pick me up-something most horses haven’t a clue about doing. He did this despite the cows nearby, of whom he used to be deathly afraid. My leg was about to contact the far side of the saddle when I realized, no helmet. My hand signaled a request for him to stay, normally not an issue. I realize this behavior may not be status quo for everyone, but it is for him. Once inside the tack room, my eyes rested on the helmet. While I was taking it off its hook, through the window, I watched as he snuck a few steps towards the cow pasture next door. When my “No” fell on his ears, I stifled a snicker. Eclipse’s hooves hurried obediently across the brick red pine straw back to the block. He presented promptly for mounting reminding me of a kid caught in the cookie jar. Once settled in the tack I queried, “You want to see the cattle today?” (Yes, I am a lunatic who converses with animals out loud.) I gave him the buckle and a breath of leg so he had freedom to do as he pleased. Picture an elegant bright chestnut dressage horse marching the 100 foot distance from the mounting block to the rusty wire cow pasture fence. He was on a mission. When the fence blocked his access to the once scary and “now oh so interesting neighbors,” his neck telescoped toward the fence that held the fuzzy cattle and their young. Time and again, Eclipse bumped it gingerly with his soft muzzle. “No give. Bummer,” I was guessing he thought. He used to be afraid of cattle, so I am thrilled with his obvious curiosity. After about 5 minutes, I said to Eclipse, “We can’t just stand here all day.” I gave it another five. I distinctly felt that he couldn’t fathom why we couldn’t have just stayed there all day gazing at the cows. It was clear that if he had the option, that is exactly what he would have done. I grew tired of looking at the same pointy hips and swinging tails, despite the adorable young calves napping nearby. Their curled bodies adorned the green field of grass, laced with a nearby stream, as if they were decorations. We left the cattle. I guided him as we meandered through the trees. The thick bed of pine straw beneath us muffled his hoof beats entirely. Leaving it, we entered the field and walked about a hundred yards. A path carpeted by grass led the way to the ring. His hooves left the ground so slowly that if felt as if he had glue on his them – a sharp contrast to his carrot store walk toward the cows. Eclipse’s pace dragged as if a horse heading to the knacker man. Maybe he was weary from the past few days of arena time? With yesterday’s lovely ride in mind, I decided to let him have an easy day. We would walk through the woods on a trail. It’s a trail Eclipse has been on a few times before. Granted, trail riding has never been his strength. But, it was very short 10 minute walk at best. I hoped he would enjoy the change of scenery. As the arena went out of sight, he perked up entering the forest and chose a sandy lane. Good! Eclipse was brightening up a little to my relief. We traversed a few hills. (Remember, we are in Eastern NC, so a bump in the road qualifies as a hill. ), I congratulated myself on my brilliant plan. I added more leg and cuddled the bit encouraging him to reach into the contact. He was really pushing well from behind-the key to all collected and upper level work. I reminded myself how good this was for his top line etc. Suddenly, my blue heeler pup trotting alongside uttered a growl and barks burst forth from her curled black lips. Hackles stood high at the sight of a branch ahead in the middle of the trail. I thought it hysterical to see her so serious about this limb and enjoyed the ferocious display for a couple of seconds. Clearly the branch was refuse from the dreadful hurricane Matthew. Then, I felt the horse’s back tighten beneath me. His head elevated and ears pricked. Soothing words followed soft rubs on the withers. Bridge signals and praise filled his sensitive ears as we passed the horse killing branch. We stopped, and Eclipse scarfed down his favorite treats as a reward for his bravery. I was fairly unconcerned at this point. We walked on. Soon, I noticed that his stress level seemed to be rising faster than the post hurricane flood waters in our ditches. My concern heightened. His muscles bulged tautly beneath his coppery coat. His entire body felt as if it were on high alert. Nostrils flared like morning glories as he read the balmy morning air for signs of danger. We rounded the corner to an opening in the trees. His paddock, his buddy – another chestnut gelding- and the ring popped into view. All were familiar sights. I hoped that seeing them would calm him instantly. Instead, he spooked- big without unseating me – barely. I found myself grateful to still be in the tack when Eclipse’s feet finally stopped. At the time, I guessed it was the heeler scrambling around in the woods a few minutes earlier that set him off. Later, I recalled another big spook occurring near the same location, but it was a long while back. This event was likely a contributing factor, since horses have memories second only to elephants. I tried calming techniques and more treats. His mental and emotional states were foremost in my mind as I considered the options. Eclipse was still a bit up emotionally so instead of completing the ride as planned, we went back to the ring. I was confident that it would help him settle since it was a place he knew well. I was sure of it. In the arena, my entire skill set was employed. All of the techniques were kind and likely to have been effective: easy walking on a long rein, close walk work with intricate patterns and gymnastics, forward and more demanding patterns, standing and relaxing for many minutes, lots of treats and canter work (just to give you a vague idea of the gamut explored). Finally, desperate for the right choice that would bring him below threshold (the level of emotion beyond which the horse is capable of coping in any given moment), I tried getting off. He responded with a huge sigh of relief. Then we attempted his favorite in-hand exercise, Spanish walk. Two steps and he spooked, again, jumping with all four hooves catching air simultaneously. I made the most compassionate and least horse trainer like choice I could muster. We went back to the barn. After the saddle came off, another huge sigh of relief seemed to flow from his very essence. I apologized for the decision to walk in the woods and hung my head. Normally, I don’t tie him to un-tack. Today, I did. The entire time I washed him and dressed him for turn out, his head was held high scanning the horizon. Eclipse looked toward the unknown horse eating beast that I never saw. This behavior was completely uncharacteristic for an easy work day at home. When turned out after riding, he always followed me to the gate, as if begging me to stay and play. Not today. The worried horse went straight to his run in shed and stood in the corner with a watchful eye. A significant change from the confident and capable horse I knew yesterday. What was running through my head? As a trainer, I wanted to bring him through this emotional trauma. But, I knew for a fact that sometimes, nothing can be done to bring a horse back from being over threshold. Thoughts circled in my mind. How was this different from a horse show? I had to be able to bring him back to some semblance of normal to show and have him not be terrified. Forget showing, he needed to be able to do most anything and not be terrified purely for his own well being. Anything included standing in the pasture on a day like this one, which he currently wasn’t comfortable doing. At least at a show if I wasn’t able bring him below threshold, the option of scratching and returning to the safe haven of his stall or going home existed. Today, I found his fear of life in general wasn’t as simple to resolve as scratching a class or loading up and going home, heart breaking as it was. In these times, the most compassionate choice is to do exactly what I did: put him in the place he felt most secure and give him time to settle. In days gone by, I might have done some horsemanship exercises, more ground work, tried harder, ridden him longer or God forbid even lounged Eclipse (aka tortured him more) and then tried to ride him again. Wisdom does come from experience, and for that I am thankful. Getting off wasn’t failure. It was the right choice. My only regret today is that I didn’t realize the level of his fear earlier on and dismount sooner. He would have been better off. I would have been safer. I am concerned that the next time I sit on Eclipse he will carry the memory of today, a fearful one. It may mean putting forth a lot of effort to cover this experience with more positive ones. No guarantee involved. Perhaps he will remember yesterday’s blissfully harmonious ride instead! Will he be fine tomorrow or will he be traumatized? Tomorrow holds its secrets. In the meantime, I will be thinking about how I can be his refuge or at least provide one in the future if similar circumstances occur. A fearful mind is misery for horses and humans alike. It goes far beyond discomfort and delves into the realm of survival, i.e., life and death. Fortunately, being scared to death isn’t the same as dying. We will both live to ride another day. I look forward to tomorrow. It is a gift, an opportunity, to have the chance to replace his misery with relaxation and joy. The challenges this experience affords and the lessons it will yield are yet to be fully realized. It is a wonderful journey of discovery and a privilege of the heart, this relationship with Eclipse, the horse who shares my soul. p.s. Not long after this ride, with veterinary assistance, we found that physical pain was contributing greatly to the fear Eclipse was experiencing and the behavior that ensued. Neither punishment nor additional training would have made a difference for him at the time. Sometimes the horse just isn’t capable of understanding the aids or his own physical state. Currently, I am happy to report that Eclipse is feeling much better with the aid of veterinary therapy. September 12, 2014 by Susan G.
It is a classic accusation amongst humans in relationships… subtle (or sometimes not so subtle) body language and gestures that make one person jealous of another. For example, women tend to be hyper-vigilant and sensitive to the attention their male partners pay to other women, and immediate judgments are formed about “the other” who is receiving the attention. Even if someone does not want to feel that way, or exhibit the sometimes-embarrassing behavior that arises from those feelings, jealousy seems to happen as a matter of fundamental neurochemistry. Is it an inherent mechanism? If so, what is it for? Sometimes the basis for jealousy, which is actually a label for the fear of loss, is well founded. This can be especially true in humans where children or personal security are of concern. The situation that triggers jealousy also evokes thoughts of steps that would need to be taken in the event of losing their partner to the object of their jealousy. It is a defensive mechanism, in short, and should the underlying causes not be dealt with directly, it can lead to anger, depression, and other associated psychological effects. In adolescents, the negative behaviors associated with jealousy are more common amongst those with low self-esteem. They may perceive their friendships as being easily threatened by others, sometimes leading them to aggressive actions . Jealousy differs from “envy,” which is the desire to have something that someone else has. Jealousy is an anticipatory emotion and one of the most common, yet unsettling behaviors exhibited by humans… and remarkably, other beings too. I say “other beings,” because it is apparent that animals can also become jealous when their “person” gives attention to another member of that animal’s species, or even another human. If dogs experience such emotions, then horses likely do too, as they also have an amygdala and correlating neurochemistry. My brother and I used to laugh at our dogs when they would immediately get in between our parents as they embraced. The dogs would bark excitedly and turn anxiously from one parent to the other. We could never determine if they thought our parents were trying to hurt each other and the dog was attempting to “save” one or another, or if the dog was actually jealous that one of their “people” was paying too much attention to the other. Apparently, now we know the answer to that. Fortunately, animals can’t quite go as far as humans in exhibiting abnormal types of jealousy, which can become quite threatening and dangerous to other people. This can enter the realms of extreme insecurity and may move well beyond the typical fighting over emotional infidelity or other common issues encountered in romantic relationships, particularly where “attachment” has been mistaken for love. In fact, there may be a neurochemical basis for jealous reactions that persist when there is no actual threat present and the fears are entirely unfounded. Neurotic jealousy may become associated with a disorder such as schizophrenia, paranoia or chemical imbalance in the brain. It is sometimes all too easy to anthropomorphize what a horse might be thinking, and sometimes, as with the dogs, their apparent jealous responses when we give attention to another being can be quite amusing. As science continues to produce more confirmation as to the actual biochemical basis for the behaviors of sentient beings however, perhaps it is not such a stretch to be thinking that our horse might be jealous when we pay attention to another. I have experienced observations of apparent jealousy in horses on many occasions and when Dr. Schoen suggested the article about the dogs as a blog post, reading it brought back many memories. One such incident was with a big dun Saddlebred gelding I would ride every now and then when his owner was away. He had been rescued from abusive circumstances prior to the owner I was working with, and found himself in a loving, compassionate situation with Katie, his new “person.” During her lessons, it had become very apparent that this horse was quite possessive of his owner, and he would make challenging faces at any horse that got too close to her. As it happened, Katie and I were very similar in appearance and energy, so it was no surprise when her horse took on the same possessive characteristics with me as he did with her. One day I was grooming him in his pipe-rail stall, preparing to tack up for a ride. Off in the distant paddock, a young horse was playing with a ball, going through some hilarious antics as he was doing so. While still brushing the big dun, my attention was on the colt that was having such a good time entertaining himself. Within a minute or so, the Saddlebred noticed my attention had been distracted to the other horse. He swung his head in the colt’s direction and his ears went back. Knowing how possessive he was of Katie I realized what he was responding to. After glaring in the direction of the playful youngster that was well off in the distance, he swung his head in my direction and gave me a “look that could kill.” Then he promptly re-positioned his body so that his neck, held regally high on his shoulders as is typical of his breed, completely blocked my view of the colt. What else could I do but laugh and return my full attention to the jealous gelding?! I think one really has to spend a lot of time around animals to fully realize and appreciate the similarities between our emotions and theirs. As Dr. Schoen and I have cautioned in The Compassionate Equestrian however, there is still the need to recognize that an animal is an animal, and that they are not “us.” Common sense has to dictate the way we handle and train them so they are safe and untraumatized, to the best of our knowledge and abilities. It takes a long time to acquire the sensitivity and skills necessary in determining when an animal’s behavior is related to normal responses and when it may be reactions to fear, pain, or other negative stimuli that can put a less-experienced handler in danger. 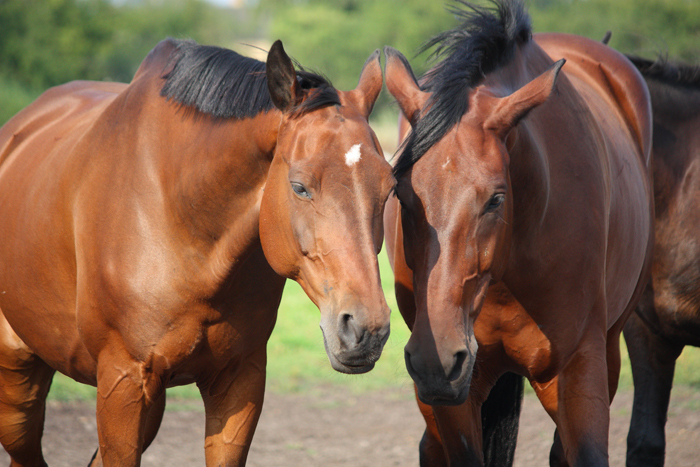 Have you recognized jealousy-related behaviors in your own horse? Tell us your story too! We would love to hear from you.